Welcoming a new dog in the home has its challenges, the biggest of which can be finding the diet that best suits them. That’s because not all pet foods are made equal—and not even all food types can be tolerated by your pooch. You may need to experiment at first to find which dog food works well and which one your dog will actually like to eat. However, there’s one thing you should know: the difference between a food allergy and food intolerance. While they may share similar symptoms, they also have different consequences for your dog that you need to watch out for. What separates a food allergy from food intolerance—and makes a food allergy a little more serious—is the immune system trigger. Both allergies and intolerance result in an adverse reaction to food, but only the former can compromise the immune system. According to the latest fact sheet from the Pet Food Manufacturers’ Association, food intolerance means that a specific kind of food does not agree well with the dog’s system. Similar to the way lactose intolerance works in humans, some dogs may not be able to tolerate milk in their diet. This leads to an adverse reaction that does not trigger the immune system. In the case of a true food allergy, Dr. Justin Shmalberg, DVM, states that a food protein may trigger an adverse immune response. This releases histamines in the body which your dog can then experience as itching or other symptoms of allergies. Both food allergies and intolerance usually appear as itching symptoms. If your dog has started incessantly scratching, don’t worry yet—Shmalberg asserts that food allergies are less common than intolerance. “That said, diet can certainly play a role in helping to manage skin conditions and diseases, regardless of whether or not your dog has a food allergy,” he says. Similar symptoms make it hard to quickly differentiate between allergy and intolerance. The best thing you can do is visit your veterinarian when your dog shows symptoms after eating. Record any foods your dog has eaten recently so your vet can narrow down the cause. Your vet can form a diagnosis and give you advice for dietary changes. Experts suggest it may take eight to twelve weeks of feeding a specific diet to find appropriate foods for dogs who show signs of adverse reactions. While you’re waiting for symptoms to disappear, make sure to keep up with regular visits to your vet, especially if any new developments arise. Look out for adverse food reactions like vomiting, inflamed skin, poor coat appearance, and differing quality of stool and gas. 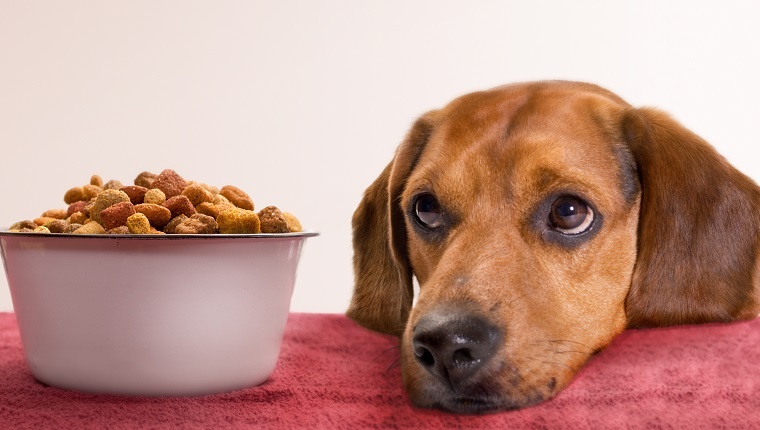 Has your dog ever had an adverse reaction to food? Was it an allergy or an intolerance? Share your stories below!